So this was the second time in Paris for me, and to be honest, I wasn’t exactly sure what to expect. The first time I went about 4.5 years ago, I really liked it, but also knew nothing about the city at the time, other than the Eiffel Tower. Lol I know, so basic right?? We also couldn’t navigate the city for the life of us, so I was actually a little nervous going back. Will I learn how to use a map this time? Will I see more than the Eiffel Tower? Who knows. However, I am happy to report that this time was SO different and SO much better! I ended up spending 8 days in Paris and totally fell in love with the city. I even learned my way around pretty damn well (thank you, Google Maps), and saw much more than the Eiffel Tower - winning. 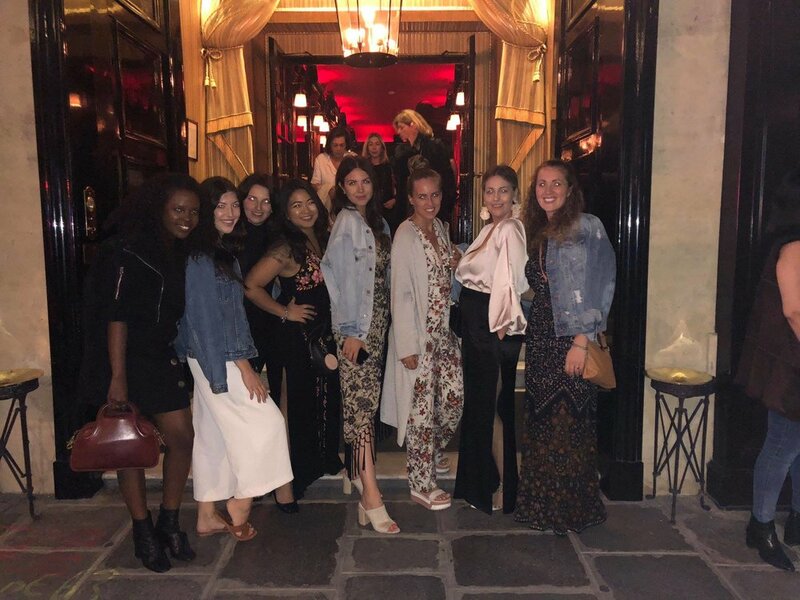 Over the 8 days a lot happened and a lot was seen - including, but not limited to biz building and roaming Paris with my biz besties, drinking endless rosé at Plaza Athénée while teaching all my friends how to floss and my mom asking “MORE PICTURES?? ?” after the 100th time I asked her to get my closeup. This is when my sister unwillingly took over the role of Instagram husband. The length of time you stay in Paris really just depends what you want to do and see, and the kind of traveler you are. Make sure you give yourself enough time to do the things and see the sights, but also time to chill out, sit on a patio and people-watch (one of my fave Parisian activities). In my opinion 4-5 days is probably the perfect amount of time. Unless you’re the type of traveler that likes to cross as many things as possible off your list in a day. Then maybe you could get away with less. Over the 8 days I stayed in two different parts of Paris - Saint-Germain-des-Près and Champs-Élysées. I didn’t love where our Airbnb was located in Saint-Germain-des-Près - I actually think it was a bit outside of the area (closer to Le Jardin du Luxembourg). But we were a short walk away from the core area which was great. Saint-Germain is super cute, trendy and just feels like what you’d imagine Paris to be like. The biz event I attended was in the heart of Saint-Germain which is where I’d recommend staying. There are tons of great restaurants, shopping, and it’s super close to The Louvre! I was obsessed with our Airbnb in Champs-Élysées. The location was perfect - you are close to everything! And there are tons of restaurants and shopping nearby too. We stayed on Rue Marbeuf which had a bunch of restaurants, cafés and a supermarket. It’s also a block away from Avenue des Champs Élysées (famous shopping street), a 10 minute walk to The Arc de Triomphe, and a 20 minute walk to the Eiffel Tower. Pictured right: This photo was taken at a villa in the Saint-Germain neighbourhood where I attended the biz event. The Eiffel Tower - you can’t go to Paris and not see the Eiffel Tower. You just can’t. I actually loveeee the Eiffel Tower so much. Yes it’s touristy, but it’s just sooo iconic and beautiful! You have to go in both the daytime and nighttime. In the day we sat in the park (Park Champ de Mars) and had a picnic with rosé, cheese, prosciutto and baguette. You guys… eating and drinking with a view of The Eiffel Tower - does it get any better?! At night the Eiffel Tower lights up at sunset, and every hour on the hour it also sparkles for 5 minutes. It is the most beautiful thing and you have have haveee to see it (it also makes for a super cute boomerang). You can go into the Eiffel Tower grounds for free, but you have to go through security so there may be a line. We went in the evening and there was no line. If you want to go up the Eiffel Tower you can walk or take an elevator - both of which you need tickets for and is probably worth getting them in advance. The last time I went to Paris we walked up it to the viewing point. It was a lot of work lol. I didn’t go up again this time. I think it’s worth doing it once if you really have the desire to, but I’ve been told there are much better views of the city than from the Eiffel Tower! Photo ops: Park Champ de Mars (for a closer view of the Eiffel Tower but still far enough so you can get the full shot in) and Jardins du Trocadéro/Palais de Chailot (area across the river with gardens and a big fountain - my fave spot for a good Eiffel Tower pic!). The Louvre Museum - another iconic piece of Paris. Over the 8 days I was probably at The Louvre at least 3 different times lol. But it’s so massive and there’s so much to look at just on the outside alone. I went in The Louvre once and it was really cool. I’m not a super artsy person so after a couple hours I was ready to move on, but I still really appreciated it. The Louvre is where the OG Mona Lisa painting is, so that was cool to see, but fair warning it’s blocked off and there will be a big crowd of tourists surrounding it trying to snap a pic lol. Still cool though! Tip: if you want to see the entire museum prepare to spend A LOT of time here. We didn’t get tickets in advance, but it wouldn’t hurt. We had to wait in about a 20 minute line for tickets once we were through security and inside. Jardins des Tuileries - The gardens at The Louvre are called Jardins des Tuileries and they are insaneeee! I recommend spending time walking through them and taking lots of pics. There’s also a reallllllly good crepe restaurant in the gardens called Café des Marronniers. We tried both the savoury and sweet crepes (I preferred the savoury) and had a glass of rosé with them. The Colonnes de Buren - I’ll be honest. I don’t know the significance of this spot whatsoever, but it was really fun to look at and take pictures at. And it’s basically across the street from The Louvre. That’s all! Montmartre - this is a really cool, old, hilly part of Paris. It’s also where the Moulin Rouge is. We spent an evening walking around, eating fresh croissants and watching the sun set and the city light up on the stairs at Scaré-Coeur (Basilica). You get an amazing view at this spot. It’s on the top of a hill that you can climb stairs to or take a cable car for about 2 euro (we opted for this lol). You can also see the Eiffel Tower light up and sparkle from a distance at Square Nadar (right beside Sacré-Coeur). + It’s MASSIVE. Like plan to spend at least a half day here, if not a full day. I wouldn’t recommend doing much else this day because there’s so much to see. + Prepare to walk - A LOT. This was probably the day I got the most steps in and I wanted to rip my feet off by the end of the day. + GET YOUR TICKETS IN ADVANCE WITH TIMED ENTRY OPTION!!! If there’s one thing you take away from this entire blog post, dear god let it be this. When we went the line was monstrous and I just prayyyyyed to myself that our ticket let us skip the line😂 (I’m very patient, can’t you tell?). Thankfully, we did. So basically a) get tickets in advance, b) get the “passport ticket” with timed entry option and c) thank me later. Part of the Palace is somewhat guided. Not by an actual tour guide, but they have it organized so you can’t just roam around. Depending on how many people are there it will take about 40-60 minutes to go through the toured part, and then you can roam on your own. Spend time walking around the gardens. The gardens are even bigger than the palace. We spent majority of our time walking around outside and it’s stunninggggg. Check it out, explore, take pics! There are also MORE palaces in Versailles. We went to Marie-Antoinette’s “pink palace” (um, whattttt??? goals.) which was a dream, and I think there was at least 1 or 2 other palaces as well that we didn’t get to. Crazy Horse - Crazy Horse is a burlesque/cabaret type show and it’s probably one of the most Parisian things you could do while in Paris! The theatre is all red velvet seating with little bar tables - just so fun. You have to book your tickets in advance (I believe before 1 PM of the day you’re going) - ours were about 100 euro each. You have the option to buy champagne when you purchase your tickets which we didn’t do, but it might be worth it. We ordered a bottle of white wine at the show which was a little pricey but totally worth it. Crazy Horse is in the Champs-Élysées area, so go for a nice dinner before the show (we went to L’avenue) and make a fun night out out of it! The Latin Quarter - this is just a fun area to walk around with super narrow, old streets - definitely Instagram worthy! Make sure you check out the Shakespeare and Company Bookstore. It’s the most adorable bookstore that makes you feel like you’re in Hogwarts. There’s also a Shakespeare and Company Café right next door - we didn’t go here, but I wish we did because it was just the cutest. Walk the city - one of my favourite things to do in Paris was to just walk around the city, stop at the cute cafés for a bite and a drink, admire the beautiful architecture and enjoy the culture. Pro tip: if you’re not using data make sure you open google maps when you have wifi so you can see where you’re going AND wear comfy shoes! I wore my old, worn out converse for a few days and my feet were not happy with me! Ok Paris seriously has some of the besssst restaurants! I’m not sure I ever ate anywhere I didn’t like, so I’m going to list the restaurants that stood out! Judy, Cantine Qualitarienne - if you’re into smoothie bowls, avocado toast and fresh juices, this spot is a gem (we didn’t find many places like this in Paris)! Les Deux Magots - at a great location in the Saint Germain neighbourhood. Super french + tasty! Order the summer salad - it’s the best! Monsieur Bleu - ahhhh location is everything here! There’s an outdoor patio with views of the Eiffel Tower, which is where we sat. It’s a super classy spot and you just feel important here, which is always nice - right? The calamari was b-o-m-b… like I could’ve ate two entire plates to myself (but I was nice and shared). And we also had the duck and lamb which were tressss tasty too! Vrai Paris (Montmartre) - just looking at this place will make you want to eat here! It’s draped in lavender or some type of purple flower and too adorable to walk on by. When we went it was chilly so we sat inside, which had no less of a beautiful aesthetic either! I ordered the salmon and you guys, so.effing.good. Get it and thank me later! Crêperie des Pêcheurs - an adorable little crêperie in Saint-Germaine-des-Pres. I can’t remember what I ordered but you can’t go wrong here! Hotel Plaza Athénée - grab your girls, go to the hotel bar, request your favourite jams, and prepare to be v.v. hungover. That’s all! + and of course drink all the wine and eat all the bread and cheese! I didn’t do a ton of shopping in Paris, which is shocking, but we did hit up a few great spots! Champs Élysées - the main avenue has tonnnnns of shopping, along with the entire neighbourhood. A lot of it is the high end designer stores (including a MASSIVE Louis Vuitton) that are so fun to check out and maybe even treat yourself to something nice ;). Galeries Lafayette - department store HEAVEN!!! I think it had 7 floors, including a rooftop bar/restaurant (now we are talking). The bottom floor is JUST SHOES. And there are like 2-3 floors of women’s clothing alone. A must seeeee! So before I left I was seriously freaking out about what to pack and what to wear. I always felt Paris was so luxurious, and it is, but I found everyone always looked cute + casual for the most part! If you’re going to be doing a lot of walking (which I totally recommend) make sure you pack comfy shoes! My worn out converse didn’t do the trick after the first hour or two and I ended up buying new shoes in Nice lol. I went in early September and I was really surprised with how cool it was in the mornings and evenings. So unless you’re going in the middle of summer, wear layers as you’ll find the temperature goes up and down quite a bit. I also 100% recommend planning your outfits in advance as much as you can. If you’re an overachiever lay them out ahead of time and take photos. OR write down your outfit ideas in a notepad on your phone (what I did). This saved me a lot of time. Especially on the days I felt less than inspired to dig through my suitcase. Coming soon: South of France Travel Guide - all things Nice, Cannes and Monaco! P.S. Want to live a lifestyle where you’re taking your own dream trips and traveling to new cities all the time?! Book a free session with me and we’ll chat about how we can get you there!